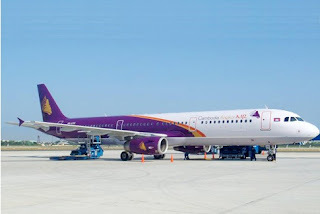 Cambodian national carrier Cambodia Angkor Air officially announced to operate daily flights from Siem Reap to Bangkok, starting November 30. The flights are scheduled operated with ATR72 departing from Siem Reap at 3:45 pm and return from Bangkok Suvarnabhumi Airport at 5:50 pm. Fares will undercut fares charged by Bangkok Airways, which served the route on a monopoly concession for 20 years. One way ticket is sold USD 201, rountrip ticket is sold from USD 315 inclusive taxes and fees for outbound ticket departs from Siem Reap. In the opening of this new route, the airline also launch a big promotion with some fixed conditions. Passenger can enjoy the flights with only USD 74 for onwe way and USD 147 for round trip ticket. This very good fares will be applied for flights from 30-Nov-12 until 31-Dec-12.